This post is a follow up to one I did a couple of days ago about TfL's plans, which are under consultation, to change the roundabout at the northern end of the bridge, in Westminster. 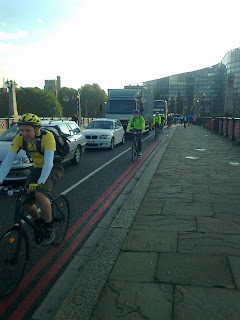 This morning I stood on Lambeth Bridge for forty minutes, from 8.25 to 9.05, analysing the motor traffic going towards Westminster (except motor bikes). In that forty minutes 358 motor vehicles passed me and, whilst I wasn't counting them, I'd be very surprised if it wasn't a similar number of bicycles. The thing is, every bicycle I saw had full occupancy - a bicycle designed to carry one, with one person riding it. By comparison, most of the motor vehicles were hugely under capacity - in fact over half of the taxis/mini-cabs didn't have even a single passenger. Car: 118 of which 81 (68%) only had a driver leaving all passenger seats unoccupied. Of the few cars with passengers, most appeared to be on the school run. Van: 104, most with one or two occupants, and an unknown quantity of essential, heavy items to move..
Taxi/cab: 87 of which 49 (56%) were empty, bar the driver. 32 of the cabs with passengers had just one (84% of cabs with passengers had just a single passenger). Lorry: 24, most with one or two occupants and, presumably, stuff to carry around. Big coaches: 1, empty bar driver and his mate. So, I'm not going to suffer any nonsense from TfL about putting in a cycle lane on Millbank roundabout affecting motor traffic capacity adversely. It's clear that a huge amount of the motor traffic straightforwardly needn't be there, and assigning it loads of space at the expense of clear, safe space for cyclists is a ludicrous thing to do given the CO2, health, pollution, economic etc. 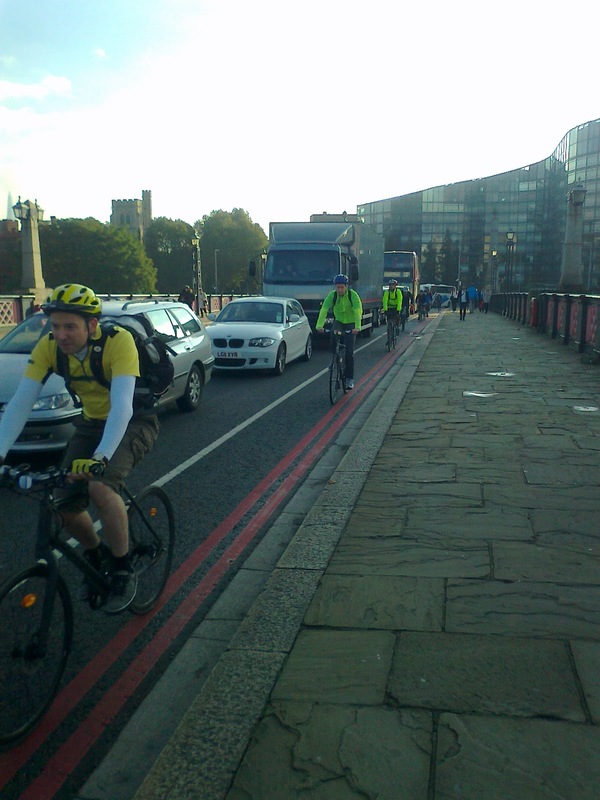 reasons to promote cycling, never mind its comparative efficiency in terms of space use.. I confess I don't have much of an issue with vans - they may drive like jeremy-hunts much of the time but plumbers and electricians and carpenters do have some heavy stuff to cart around and doing it in a Bullitt would be a heroic effort indeed. Ditto lorries apart from the obvious question about whether they should have restricted operating hours and if so when, and also the big issue of how big truckers are remunerated - the prevailing curse of piece-rates probably explains a lot of the awful driving behaviour of truckers who are really under the cosh when it comes to scraping a living. Even taxis I could live with, if we were to assume that eliminating private cars would boost their trade and make them more densely utilised, while at the same time reducing on-street parking so providing more street space for cycle lanes or contraflows. The villain is the private car, driven by its owner. Like 3/4 of the population I have one of those, and jolly handy it can be, too, but I would regard it as beyind the pale to bring it into a congested city centre with a comprehensive public transport network and the potential for cycling most middle-distance trips. Banning them altogether (bar registered disabled) would permit one lane in every dual/triple lane road to be dedicated to bicycles with no harm to the remaining motors, indeed they would probably see improved journey times. I was surprised that the private car category had the largest number of vehicles. I'd be interested to find out how many miles taxis do while empty relative to the number of miles occupied (and what impact trips to the airport have on the proportionality). I was reading that taxis take up 37% of the road space to carry 1% of the population in, I believe, central London.